The holiday season is a time to reconnect with family and friends. It’s also the season to dust off those old family recipes, many of which are best kept for once-a-year consumption. I’m from the Midwest. Quite a few of the favorite dishes my family counted as “traditional” were conspicuously midcentury in their origin. Cranberry Jello salad laced liberally with crushed pineapple, celery and nuts. Green cornflake wreaths decorated with Red Hots. Canned green bean and condensed soup casserole, topped with french fried onions and cheese. This year, I’m planning to mix up my holiday menu with recs courtesy of the fascinating foodies I’ve researched this year. It’s my job to discover and share the (often passed-over) ideas and stories of women and girls from all fields, including the culinary arts. Here are quotes, recipes and the stories behind them sourced from Quotabelle’s collection—perfect for spicing up December baking sessions and holiday parties. 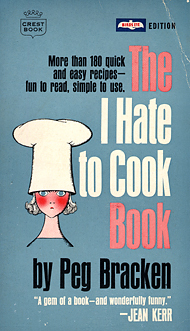 When copywriter and humorist Peg Bracken went to publish her irreverent I Hate to Cook Book, it was rejected by 6 male editors who flatly refused to believe the market implied by the title existed. When a female editor undertook to print Peg’s book in 1960, it was an instant bestseller. This essential midcentury kitchen companion was born out of an ongoing collaboration among working women. They “pooled their ignorance” to come up with dishes that were easy to prepare, tasty to eat and hilarious to read. The recipe for “stayabed stew” ordered the chef to go back to bed for 5 hours while it slow-cooked itself. Peg’s instructions for the ever-popular “hootenholler whisky cake” advised the baker to start with “a small snort” of the titular ingredient “for medicinal purposes.” And it reminded readers to “buck up” the delicious leftovers now and again with the aid of an ice pick and an eye dropper. ½ c flour, ¼ c butter and 1 jar processed bacon-cheese spread. Simply mix, roll, refrigerate, slice into discs and pop in the oven for 10 minutes at 400º F. No need to grease that baking sheet. Nitza Villapol was the host of the longest running cooking show on television. 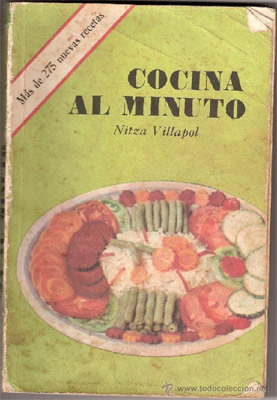 The first episode of Cocina al Minuto aired in Cuba on December 23, 1948. The popular program survived the 1959 revolution and continued for nearly 3 decades following, with the loyal Fidelista serving up countless helpings of her signature black beans and picadillo. During her TV tenure, Nitza personified Cuban cooking—and patriotism. The people’s chef tried to wean fellow citizens off their traditional meat-and-starch diets and cheerfully adapted her recipes to fit the current rations. When ingredients were scarce during food shortages, she’d encourage cubano “ingenuity.” If the rice ran out, she’d add macaroni to her beans. If potatoes were the only thing on offer, she’d exhaustively demonstrate the many things you can make from potatoes (salad, mash, stew…even jam and mayonnaise). Nitza’s cookbooks were considered so precious that they were often smuggled off the island and passed down through generations. Her holiday tips? Marinate your turkey for at least 10 hours in garlic, lemon, orange, cumin and oregano. Stuff the bird with arroz congris (Cuban black beans and rice). For a seasonal postre, add calabaza (butternut squash puree) to your flan. 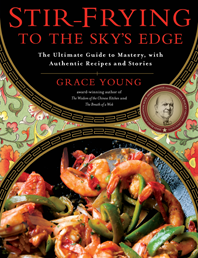 Julia Child may have been her childhood idol, but today Grace Young has left behind the pastry and cream sauces to become the “poet laureate of the wok.” It’s an alias that pays homage to “timely and timeless” traditions of Chinese cooking she first learned at home. Behind the food in Grace’s three award-winning cookbooks is a “yin-yang” philosophy that calls for contrast and balance in flavors and nutrition. Follow this stir-fry master’s tips, and you, too, can make culinary magic from hot pepper beef to chili mango chicken to seared sugar snaps. Marinate your meat. Make sure your veg is fresh and dry. Never overcrowd the pan. And, be a good listener—because when a wok sings, it’s ready. Some holiday wisdom from Grace—ditch the butter and cream, and wok your way to healthier sides that don’t hog valuable real estate in your oven. Try stir-fried Brussels sprouts with shallots, sherry and pine nuts or stir-fried balsamic ginger carrots. For Chinese New Years, go for a mushroom-based main…quick-growing fungi are associated with good fortune. Today, her iconic TV kitchen is a bonafide Smithsonian exhibit, but Julia Child was no natural when it came to the culinary arts. She grew up thinking she would go into science. The first recipe she cooked up was for shark repellant (as a US Navy researcher during WWII). She failed her first exam at Paris’s École Cordon Bleu. But, this dubious resumé made Julia the perfect person to take the “bugaboo” out of Continental cuisine for the rest of us. Her first major publication—the 1961 magnum opus, Mastering the Art of French Cooking—led to a PBS gig where she debuted her classic live show The French Chef with a savory pot of boeuf bourguignon. For the next decade, fans tuned in to see her pragmatic instruction and infectious enthusiasm brought to everything from paté to soufflé. Ready to commit to a Julia-style holiday dinner? Go for a well-trussed goose! Stuff it with brandy-soaked prunes, chestnuts and ground pork. Quotabelle is now on Indiegogo, if you’d like to help them give life to more women’s words.